Johanna Basford's coloring books are some of the most popular on the market these days for their intricacy, creativity, beautiful illustrations, and whimsy. Her newest, Lost Ocean, is just as gorgeous and fanciful as her previous books, The Secret Garden and Enchanted Forest, but in some ways it's even more intense. 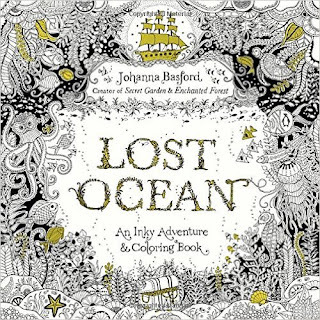 The grown-up coloring groups on Facebook have been all a'buzz about this volume...some good, some bad. If you're familiar with Basford's previous books, there have been some changes. The American version of Lost Ocean doesn't have a dust jacket (doesn't bother me one bit), and some say the paper is of a lesser quality, but I haven't had a problem with it. Her previous works were also published on a cream paper while this book is a much brighter white, which I personally prefer. While some of the images in this book are far more intricate than some of the images in her earlier works, I still think there's a great mix of super tiny, maze-like coloring and images that are more open and allow for a little more freedom in the shading and are, in general, a rest on the ole hands. The image above is one of my favorites. I haven't started it yet, but it's high on my list of images to get 'round to. 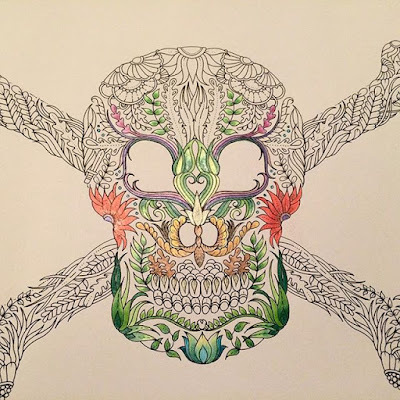 This skull is the one I started with. I've made a lot of headway since this was taken, and I'll post the finished image on my Instagram. If you're interested in seeing more of this book, I've linked a flip-through video down below. I got a sampler of this book and went ahead and ordered the full book. I really like how much variety there is within it. Me too! Some pages I look at and think, "There's no way I'll ever tackle it," but most of it looks like an amazing lot of fun. And a challenge! I own the Enchanted Forest book by this author and might want to get the Lost Ocean eventually as wel as I like the sound of the ocean theme. 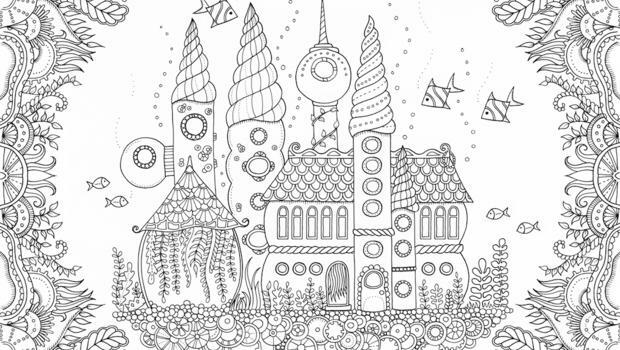 That underwater castle you haven't coloured yet, looks very pretty! I think I also would prefer the more white paper, so that won't bother me. Great review! Thanks, Lola! 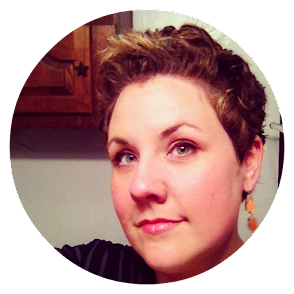 I'm enamored of all things ocean-related so this one is right up my alley! This book is on my Christmas wish list, Andi!! I love that you're giving me a sneak peek! My husband asked me to create an Amazon wish list; he should've known better - ha! I can't wait to try this out; I think it's going to be super fun. Yay! I hope you receive it because it's gorgeous! Staying in the lines....totes optional. I hope you find a grown up book you like enough to try out! I have been meaning to get A coloring book. Maybe I will get one for Christmas. You should! There are so many good ones! 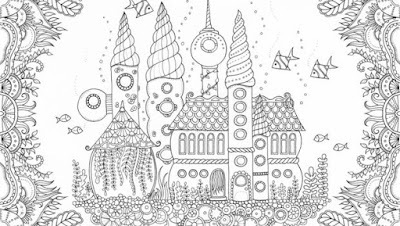 I just bought my first "sophisticated" coloring book yesterday! Plan on posting about it next week, but I was so excited. I bought a 24 pack of watercolor colored pencils too! Oooh, now you have to tell me which one! And grab the 50-pack of Crayola pencils. Heaven! Tropical World by Millie Marotta. I started one picture, feels like this book will last me forever! So much detail. 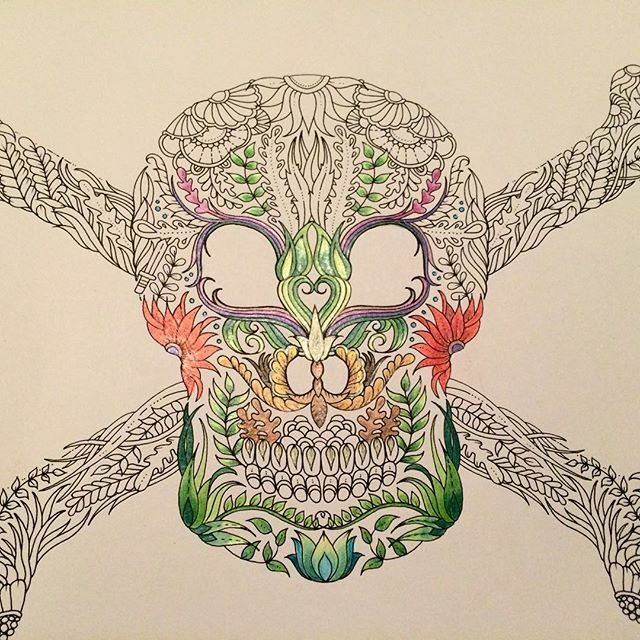 I think I most be the only person in the world who doesn't find colouring in relaxing. It's sooooo stressful - trying to stay between the lines, what colour to use next, should I shade light or dark, how do I make it look aesthetically pleasing....arghhhhh I can feel a migraine coming just thinking about it!! I feel that way about crochet and needlework. I get all tense and it's no fun at all, whereas my grandmother used to make entire bedspreads out of something that amounted to kite string. I haven't colored in a few weeks but this book will eventually draw me back in! Hey i just bought this book a little bit cheaper than the common price, the seller claim its original and he imported them in massive amount, so he can sold it in low prices. But when i got it, i feel the paper is different with secret garden and enchanted forest. Its feels like only around 100grams while her previous book is arounf 120grams. Do u feel the same with yours? I just want to check if i need to make a complain to the seller. Thanks a lot!